"It's delightful when our imaginations come true, isn't it?" If you rewind the VHS of my life twenty-six years, you would find me in the year 1992: standing in my Kindergarten music classroom, alongside fifteen other five and six-year-olds, singing the soundtrack from the brand-new Disney hit, "Aladdin" at the top of our lungs. My mom, a piano and music teacher, volunteered at my school (bringing my littler sis along) and worked hard to coach the group of little girls in our Jasmine and Aladdin t-shirts to sing on rhythm to the brand new movie's theme song, "A Whole New World", for our first school performance. (We have this on video somewhere and it's hilarious and oh so 90's, and brings back all the sentimental feels.) From an early age, I desired to see the big, wide "shining, shimmering, splendid" world. A natural homebody and lover of "home comforts", my big, passionate homebody heart also beat for adventure; for doing things differently than the rest of the world, for being a pioneer, for taking risks, for being wild... and free. If you rewind the VHS of Daniel's life twenty-six years, you would find him running wild on the red dirt of his family's Oklahoma farm. Reading books, listening to and practicing music, drawing pictures, roaming free on his family's land and creating "movies" with the video camera alongside his twelve siblings, his heart lit on fire for adventure out in the "great wide somewhere." He's an adventure-man. Exploring and risk-taking, it's always been in the deep, foundation parts of his soul. As he grew into a man, he also grew into his adventuresome heart as it weaved into and out of all the things he would be. In 2010, he went skydiving! And since then, he's never stopped diving and soaring (headfirst and fearless) into all the adventure life holds. Daniel skydiving in Oklahoma, 2010. Always brave, curious, and fearless, he imagined and hoped... dreamed... of getting out into the big world someday and boldly exploring it all. Together, Daniel and I love and crave adventure. We always have, before we ever met. The seeds of adventure and romance planted and rooted in both our hearts as children, through the books we read and stories we were told, through the dreams we dreamed and life we imagined. Both our sets of parents taught us and encouraged us to dream big and never once questioned any of our wild and crazy ideas, schemes, and dreams as kids, all the way to adulthood. Both of us were homeschooled, and we look back and see that this unorthodox lifestyle and perspective our parents raised us with added fuel to the "wild and free" fires in our hearts! Kindred spirits in all of this, when we met four years ago, one of our first and main connecting points (alongside our chemistry, attraction, personalities that mixed so well, and shared values) was our heart for adventure. As late-twenty-somethings, we were both living unique lifestyles and jobs: equally intent upon some very specific, unique, and big-as-the-sky goals and dreams. He, a full-time street performing viola player (who sometimes supplemented income with helping out at his family's construction business) and I, a blogger and writer (and nanny sometimes on the side) - we both lived with family and didn't rent/own our own living spaces (of course, Daniel owned his own plot of land in the Oklahoma countryside. He had saved up and worked very hard for, in hopes and preparation for his future family; he was in the process of building a home on the land.) We didn't live the typical "9-5" life. One of the qualities that drew me most to my man is his spirit of adventure, his fearlessness, his willingness to take risks other people aren't willing to take, his sheer creativity, his originality, his wisdom and thoughtfulness in taking those risks, and his work ethic and humility: he is willing to do what other people are not willing to do, when it comes to working hard and taking chances for greatness. I call him "The Honeybadger" - he's just so so determined, flexible, and resilient. Our hearts beat to follow the Lord and to take the paths He had planned for us, even if it looked totally different than the rest of the world, our culture, or our generation. The way we met truly is a testament to our hearts in all this: "meeting" and being matched-up on Instagram, of all places, certainly isn't typical or what we expected! And yet, it's the way God brought us together! Looking back, we now see that if he hadn't fearlessly pursued music and I hadn't fearlessly pursued blogging (even though lots of people said/thought we were crazy, as we started out) we would not have met. We experienced hard seasons when we first started. He quit his steady construction job and jumped right into playing music - he began busking on the street near DC in Maryland. He played hours and hours and hours a day, in the rain and frigid cold and snow and hot humidity. Sometimes, he even slept in his truck. With the support of his sweet family, he chose to do music and just started. And he's been so blessed in it, and the kindest people have appreciated his hard work and talent. And while some people do not understand his heart and his moxie (some have mocked him or spit in his viola case) while many other people weep tears of joy as the music he shares pours from his viola strings and into the air, moving and speaking to their souls. When we met, we shared our stories and hearts on this "wild and free" lifestyle of chasing dreams; I told him how I quit my office job in my mid-twenties to move home with my parents, worked for a while as a nanny, and started a blog. My parents were supportive of me and encouraged me along the way, but lots of people in my life thought "starting a blog" was insane, and told me so (this was well before blogging became a multi-million dollar and high-recognized industry as it is today!) I didn't have my own car for most of the time I started my blog and set out on my adventure. My lifestyle was extremely limited, and I chose for it to be - wanting and hoping for something more, someday. Daniel and I made sacrifices to pursue our big-as-the-sky dreams, not knowing where we'd end up. But, the Lord knew... He knew we would be running together soon, side by side. After that first week together, Daniel and I sensed that our connection, chemistry, and new friendship felt special. And so, without batting an eye, he picked up from his home bases in Maryland and Oklahoma, packed up his old truck with all his worldly goods, and hauled out to Los Angeles, California, where this new girl he met lived! Long before we met, the idea of moving to LA to do music mulled in his mind, and this gave him the perfect opportunity to up and do it! When we got engaged, he played music full-time on the street, finding warm reception from Californians and tourists, alike. As time went on and the past few years unfolded, we've been blown away by the amazing opportunities the Lord has provided for Daniel in Los Angeles, and all over the world, and the way his music has been received, appreciated, and loved. Growing up as PK's ("Pastor's Kids ;) neither of our families had much resource to travel, and yet, as our formative years progressed, God gave us each opportunities before we met to see the world. And the travel bug bit us both! For me, the first big adventure happened at age thirteen (I wrote of it in At Long Last.) When I became a Christian at age eight, a hope bloomed in my little heart as I read the Bible: I dreamed of being baptized for the first time in the Jordan River in Israel, just like Jesus. I prayed and prayed for the dream to come true, even though it seemed impossible... and soon, the dream came true. My dad, a pastor, led a three-week trip with our church to Israel and our family was blessed to accompany him. This was my first overseas, international "big" travel trip. It rocked my world (in the best sense) and changed my life, forever. A few years later, Dad led a three-week trip to Greece and Turkey ("In The Footsteps of the Apostle Paul", and our family was invited along. During this time, my sister and our best girl friend and I began to dream of visiting Ireland together, someday. We prayed, fervently, every time we got together and prayed separately as well, that the Lord would open the door for us to travel to Ireland -- as impossible as it seemed. Lo and behold, He answered our childlike pleas, and an opportunity arose for us to spend almost one month on the Emerald Isle together, in 2003. Years went by and through my twenties, I took a couple of short trips solo (such a good, growing experience to travel alone as a twenty-something!) to visit college friends and speak at or attend blog conferences (Seattle, Arkansas, Dallas, Indiana) but there were many years when travel - even taking a two hour trip to attend a friend's graduation party - did not fit into my budget. And so, other adventures were lived, instead. Books read and lessons learned, the experience of beginning to start and build my own business and dreaming of all the things. In every season, I discovered, there is richness to be found and exciting steps to be taken. 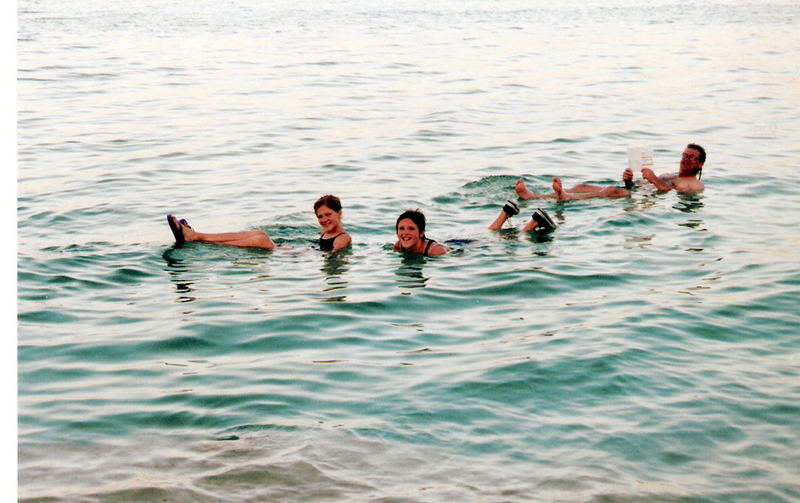 Floating in the Dead Sea with Dad and Sis. Israel, 2000. Leaving Athens, Greece to cruise the Grecian Islands in 2002. Daniel is a twin, and when his twin brother found the love of his life and prepared to be married, Daniel's heart rejoiced for his brother's happiness and dreams coming true, but he knew in his soul he needed a way to move forward into a new season (because, of course, twins are very much attached and when the childhood "twinhood" changes as children become adults, the change can be an uncharted and difficult one.) And so, he decided to follow the burning desire in his heart to see the world. 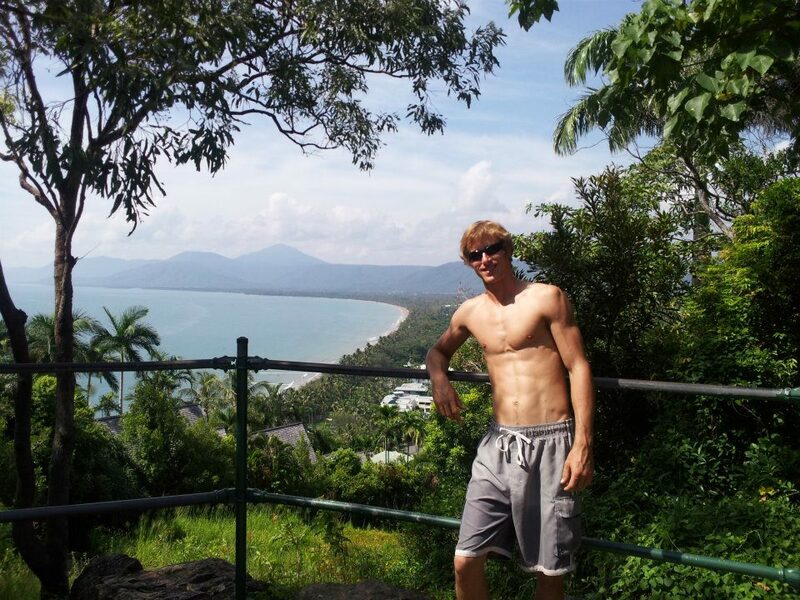 He flew miles from home, to Australia, to spent time serving at a YWAM in Townsville and Cairns. His first big travel adventure, he relished every moment in the brand new place, soaking in all the sights and sounds, culture and people. The three-month trip rekindled his passion for music. During his time there, one of the YWAM leaders asked him, "What lights a fire in your soul?" Daniel thought for a moment and couldn't help but answer: "Music." "Then do that." The leader said. And so, Daniel went back to the states, and did just that. On his long trip back to the states (Cairns to Brisbane to Los Angeles to Dallas to Oklahoma City: a grueling fifty-two hours of travel time!) he spent his longest layover at LAX. Little did he know, the future wife he was praying for lived just sixty miles away. Hoping to catch a glimpse of this city he'd never seen, he hopped on a shuttle that took him from the airport to Santa Monica Pier. In a crowd of strangers, he walked down the boardwalk, his viola on his back, taking in the sights and sounds of the new place. He noticed lots of street performing musicians on the Pier and asked a few of them about their unique jobs of busking. A few hours to before needing to head back to the airport for his next flight home, Daniel decided to play his viola a bit on the beach. He chose a sandy area near the Pier, in front of a big apartment building. He sat on the ledge that divided the apartment building's sidewalk and the beach and ocean, and played. Little did he know, three years later, he would be playing his music, full-time, on that very Pier. And little did he knew, three years later, he would be living with his new wife in that very apartment he played in front of...... Little did he know. Daniel's life became a bit of a whirlwind in the year before our paths crossed and joined in love and bliss. He trudged through a dark valley, one filled with long days of debilitating depression and long nights of questions and numbness. He went down into the depths of despair and when he surfaced into the fresh air of hope, again, he flew up on the wings of anticipation for life and all it holds. Through lots of grace and support, he began to heal and recover, thank the Lord. He suddenly felt so good, so alive, so much better. Full of life and dreams, he raced full-steam ahead, full speed, pursuing his dream of music, head on. It was a hot, humid August and he had to get out of Maryland, travel and see the world. Be wild and free! He booked a flight to Switzerland, somewhat "off the cuff" and spontaneously. He landed in Geneva. He spent a week in the breathtaking Alps. Then two days in Venice, Italy. It was romantic, charming, and quaint, perfect for lovers. But, alas, he was alone. Down the coast of Italy. Across the Adriatic Sea to Greece. Up to Macedonia and Serbia -- thinking he was in Romania (he accidentally took the wrong train!) Over to Budapest, Hungary. And onto Vienna, Austria (a cornucopia of music history that thrilled him). Sleeping in train stations. Staying in hostels. Eating croissants and Danishes. Drinking espresso and European beer. Up to Prague, across Germany. Busking as he went, making enough money to pay for food and tickets. On to Amsterdam, the Netherlands, Holland. Back down to Brussels, Belgium. Then down to a rainy Paris. He asked a local man where the sun was: he told him to follow the sun to the southern coast. He followed it to Marseille, France. Then scuba diving in coastal Nice. And to Cremona, where Stradivarius violins were crafted. Back up through Italy, to Lucern, Switzerland, and again to Geneva. Then, home to America. The adventure of a lifetime. We met a few months after his European whirlwind. And he told me about it all, as one of our first conversations and strung throughout all of our talks. Right off the bat as a young "just talking" not-yet-couple, we imagined trips to Europe, together; trips through to the whole world. First, we're going on an adventure: Europe, again, this spring. And then, we'll get our hands dirty and dreams afloat again with our vintage beauty. We are grateful for adventure: in all the forms it takes. Our God created this big and beautiful world, and we are grateful to see it - and to see Him in it.There are corny sayings on mugs that go something like, "Travel is the only things you buy that makes you richer." But really, we think this is true! There is a world of riches to gain when you get out and immerse yourself in the world. And especially, when you take your babies with it. It is not always easy, but it is oh so worth it. And such joy! Our hearts and minds are filled with dreams of exploring the world, in all the ways, and giving to them - and seeing Him - in it all. One of our happiest joys is when our people, our family, our friends, travel and see the world. We rejoice with them and just love it all - together, and apart. It's just one of the happiest things to our hearts to see those pictures, hear the stories, know the depth and richness experienced. And witnessing our son see the world.... oh my heart, it is the absolute best. "Sometimes people ask me why I travel so much, and specifically why we travel with Henry so often. I think they think it’s easier to keep the kids at home, in their routines, surrounded by their stuff. It is. But we travel because it’s there. Because Capri exists and Kenya exists and Tel Aviv exists, and I want to taste every bite of it. We travel because I want my kids to learn, as I learned, that there are a million ways to live, a million ways to eat, a million ways to dress and speak and view the world. I want them to know that “our way” isn’t the right way, but just one way, that children all over the world, no matter how different they seem, are just like the children in our neighborhood—they love to play, to discover, to learn. I want my kids to learn firsthand and up close that different isn’t bad, but instead that different is exciting and wonderful and worth taking the time to understand. I want them to see themselves as bit players in a huge, sweeping, beautiful play, not as the main characters in the drama of our living room. I want my kids to taste and smell and experience the biggest possible world, because every bite of it, every taste and texture and flavor, is delicious." Our romance and adventures and now, our little family, go hand in hand. Adventure doesn't always look like a stamp in your passport. Sometimes, a great adventure may be taking a risk and quitting your job and starting your dream business. Sometimes, a great adventure may be enduring and enjoying months and months of carrying a baby in your body and heart, and then holding your little bundle of love in your arms through glorious and sleepless days and nights. Sometimes, a great adventure looks like waiting for and looking for and finding the love of your life. Sometimes it looks like your dreams and love Sometimes, a great adventure looks like enduring through the deepest pain and one day, finally seeing the light shine through the darkest of tunnels. Sometimes, a greatest adventure looks like trusting Him and believing He is who He says He is, even though it's hard to see. Sometimes, a great adventure looks like opening up your home and heart to someone who needs it. Sometimes, a great adventure looks like quietly serving, patiently waiting, humbly giving, and denying your dreams and wants for the good of someone else. Sometimes, a great adventure looks like forgiveness and healing. Sometimes, a great adventure looks like choosing to "laugh at the days to come." Sometimes, a great adventure looks like leaning in and embracing the pain and leaning into the heartache, hoping to find light on the other side. Sometimes, a great adventure looks like loving someone, exactly as they are, and watching them bloom and become. Flying through the clouds, across the sea to check dreams off your bucket list with the ones you love is a great, great gift. Choosing to spend your dollars on creating experiences and making lifelong memories is a thrilling way to live. But it's not the only way to have adventures. In fact, it's just one small beautiful way. I know, very well, what it feels like to not have the ability to travel, due to financial constraints, life choices, responsibilities, and health issues. To be able to fly across the sky and see new lands and meet new people... it's a gift, like all of the good gifts He gives, and there is a season and day and time for each rare and precious gift. "For everything there is a season." What does "wild and free!" really mean? I have learned: perhaps it's less about looking for those big "Instagrammable" moments and more about finding pleasure in the simple things, in the gifts we are given, that are right in front of us, today. Finding freedom to enjoy all the good in this wild, wonderful, mundane, heartbreaking, exhilarating, exhausting, much too short, stunningly gorgeous, miraculous gift we are given called life. Today finds me taking out the trash bag with my trash-truck obsessed almost two-year-old who calls, "TRASH TRUCK! TRASH TRUCK!" in his sweet tiny voice. Next month may find me dancing with Love under the Eiffel Tower. Both are equally beautiful, both are my treasured, precious gift. The comforts and sweetnesses of home and the thrill and joy of travel: equally beautiful "adventures" - just two different forms. For many years, I wrote love letters to the man of my dreams. Less of a “thing Christian 2000’s girls do” and more of a “wildly romantic & sentimental heart” thing, some may think it’s silly, but it meant something — a whole lot of something — to me. My emotions are, and always have been, close to the surface, threatening to bubble over at the drop of a hat. Writing, and specifically journaling, became the way my mama encouraged me to process, think and handle “all the feels” as a young girl. Atop my long list of dreams was the hope of finding my one true love someday, my prince, the love of my life — and I committed to wait for, pray for, and hold out hope for a forever kind of love, and a unique and beautiful kind of love story (they all play out so beautifully and redemptively, and differently than we plan, I have found.) And so, the sentiments of my longing, wondering, sometimes lonely waiting heart found their solace in penning words of love to my “someday someone” and the words spilled out of an overflowing heart onto the pages of cards and paper and journals. I could’ve written the song “To Whom It May Concern” by The Civil Wars: “I miss you but I haven’t met you.” In 2003, I bought this blue spiral-bound “Monet” journal and filled it with letters. A few years later, I scribbled dreams of romance and adventure on the backs of Paris postcards. While other teens played sports, my old-fashioned heart found myself lost in Jane Austen novels and films. Little did I know, my adventure-hearted boy was dreaming with me, unknowingly, from afar. My romantic heart and his adventurous one are embarking this weekend on a romantic and adventurous trip as a little family and I am ever so grateful and do not take it all for granted. If only I could tell my young self, who would wait fifteen years for her love, that he‘d someday be here & work hard for days and months, playing his violin on the beach & the street and at weddings, to put stamps in our passports, and make those Monet-journal pages of dreams (dreams of making tacos at home and exploring France and unconditional love and serving Him together) come to life. We fly out Sunday and will be in Europe for one month! Ecstatic and thrilled, we have lots and lots of plans up our sleeves and dreams in our hearts for this little slice of time together. I am most excited for uninterrupted time with my boys, time where my love doesn't have to go off to work all day, and we can explore together constantly. Since our last visit to Europe in September of 2017, we planned to take a longer trip (9 days was blissful but not long enough! ), go back to some of the spots that enticed us (parts of France and Paris) and to see a new country altogether, England. Most of my family's history and lineage is found in England (my grandfather was born in England and grew up there -- he and his siblings always have had a bit of an English accent!) and the UK has always sat high on Daniel's (very long) bucket list. Our boy Weston has taken 26 flights in his almost two years of life, and he's the best traveler. We've planned to take him on one bigger trip before his second birthday (after two years old, kids are no longer free to fly or travel) and tossed around ideas for places to go. 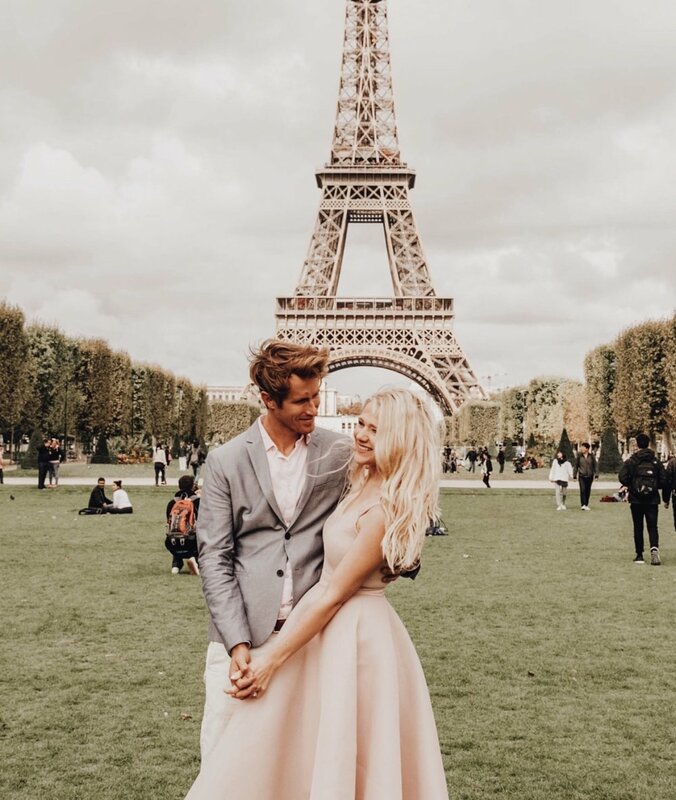 When our thrifty sister in law Kristen discovered and shared about some cheap flights London and Paris flights (shout out to her!) we chose Europe in May. Partly to get one last trip in before Weston's birthday, partly because Daniel work schedule is happily booked out almost every other weekend in 2018 after May, partly because I am a California weather wimp and always get sick when traveling in the fall and winter, so we thought spring-early summer could be a better time weather-wise, partly because in the next year we have some big family plans and dreams to accomplish and this is our little open window of time to take off, partly because we are celebrating three years in marriage in May and we always celebrate, not with gifts, but with a trip together. (Oh, and when we found out the Royal Wedding just happens to be the week of our anniversary in a place where we could get under $200 flights across the pond? "Let's do it!" we said!) And so, we did. I will be sharing and updating on our trip over at my Instagram and will recap it all here afterwards! So, my forbearing reader, thank you for hearing my heartfelt and scattered musings on the topic of adventure and travel, the form it takes sometimes. My heart is full and grateful for this life with my guys, for the undeserving gifts given to us and the specific prayers answered. Thank you for sharing our journey all these years, for laughing and crying and cheering and holding us up, from afar. It's a blessing to share life here on our blogs.